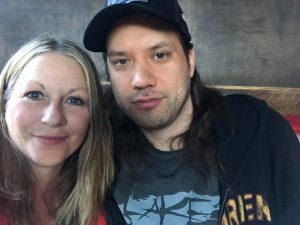 I was fortunate enough to sit down with Janne of Children of Bodom prior to the show. I also am possibly Portland’s biggest Wolfheart fan. So, prior to arriving, I stopped at the local store to buy some fresh Oregon products for both bands. I decided on Rainer Honeycrisp apples, and Moonstruck chocolates. I awaited Janne in the bar, and the tour manager came out to greet me. He said 5 minutes, and then in walked Janne. He was funny and personable and we talked about many things. I gave him the gift and he was off. During my interview, fellow interviewer Tony was interviewing Henkka, and we exited at nearly the same time. I told him, “I have a bag full of apples and chocolate for Toumas of Wolfheart, but I’m too shy to go over to the bus. I never like to impose on their space unless it’s planned, and that caused me a dilemma. Tony was game, and waited with me for a few minutes until he came out from soundcheck. We chatted for a moment, and I gave him the apples, and we were off. I felt like Baby in Dirty Dancing, “I can’t believe I said I carried a watermelon,” but it was worth it. Belgium’s Fragmentum opened the night with their personal style of Melodic Death Metal. Relatively new, they performed with polish and class that would rival a band of much longer tenure. People were there to see Wolfheart, Swallow the Sun, or Children of Bodom, however, and it showed in the relatively quiet and still crowd. I love Swallow the Sun, but I listen to them in an odd way; I turn it on as I’m going to sleep. Not at all that it is boring, or sleep inducing, rather, it just makes me really happy and calm. It is complex and comforting, cold and atmospheric, sort of like a dream. So, while I loved seeing them, it was a weird transition for me between the pummeling Wolfheart and the vivacious Children of Bodom. They were excellent, performing a relatively long set. ​Part way through their set the crowd started chanting Alexi, and Bow Dum, Bow Dum, but it wasn’t because Swallow the Sun were bad. It was simply because everyone was so excited to see them. The sold-out crowd stayed for Children of Bodom. I initially thought many would leave after Wolfheart or Swallow the Sun, because they both carry their own dedicated fan base, but I was wrong. Compared to prior years, their stage set was modest. Once Alexi came into view, the crowd erupted in a wave of movement and sound, and the show began with “Are You Dead Yet.” Alexi, a little more demure than prior years, indicated that Jaska Raatikainen wasn’t feeling well (possibly food poisoning) but they would go as long as they could; they immediately busted out “In Your Face.” Throughout the show Alexi thanked us and genuinely showed his appreciation for our dedication. 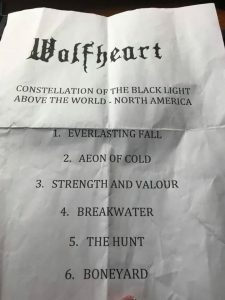 Their official setlist included: “Platitudes and Barren Words,” “Bodom Beach Terror,” “This Road,” “Everytime I Die,” “Under Grass and Clover,” “I Worship Chaos,” “Hecate’s Nightmare,” “Angels Don’t Kill,” “If you Want Peace…Prepare for War,” and “Hate Me!” After “Everytime I Die,” I lost track because I was so distracted by the drunk lady behind me that somehow thought throwing punches at my back was part of metal show etiquette. I withstood the ebb and flow of the heavy crowd pushing my ribs against the steel barricade, and the jabs to my back, and left drenched in sweat and thoroughly satisfied. Children of Bodom are unique and wildly entertaining. Janne’s expression when he plays is of pure joy, Henkka still communicates aggression with a side of class, smiling more than I’d seen him in previous years. Newcomer Daniel Freyberg was very energetic and talented; he made playing the guitar look easy (which I’m sure it is not in this band.) Jaska stayed behind the drums, and but for Alexi indicating he wasn’t feeling well, you’d not know. Alexi’s voice was strong and on-point. He commanded the violent and agreeable crowed as usual, who were often chanting, “Alexi, Alex.” As Janne said in our interview, “We don’t do that anymore” when asked if they still initiate people into the Hate Crew by making the person stand on their head and leak alcohol out of their nose, this tour saw no classic Alexi side hair sweeps, or talented guitar flips. However, I’m optimistic that it is just a blip in the Matrix. Children of Bodom remain the best at what they do, and as shown in Portland, Oregon, on this night, they are a highly revered band who we need in our lives.